On this Veterans Day, I want to note an annual event I attended this week, on November 7, put on by the Jewish Institute for National Security Affairs (JINSA), which honored six young military heroes. The six represented each of the five branches of the U.S. military and the U.S. Special Operations Command. 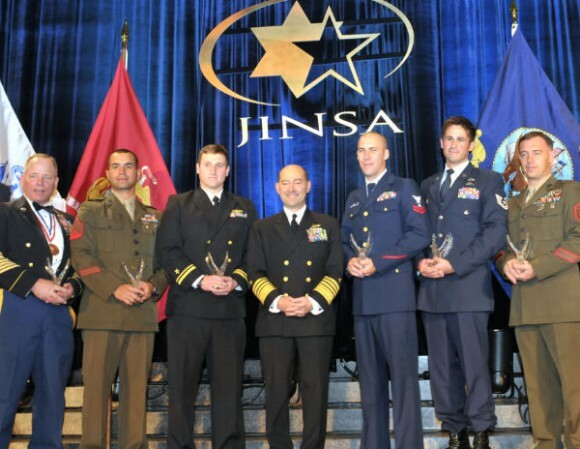 They were honored “for having distinguished themselves through superior conduct in the War on Terrorism,” and each received a Grateful Nation award from JINSA. JINSA is a Washington-based think tank that focuses on issues of the U.S. and Israel in national security. The honoree of the evening was ADM James Stavridis, who was awarded the 29th Annual Henry M. Jackson Distinguished Service Award. Admiral Stavridis commanded Enterprise Carrier Strike Group, carrying out combat operations in the Arabian Gulf as part of Operation Iraqi Freedom and Operation Enduring Freedom. In 2009, he became commander of European Command and the Supreme Allied Commander, Europe. Adding to the poignancy of the evening was the fact, cited by the master of ceremonies of the evening, FOX News’ Catherine Herridge, that among the guests in the audience last year at the Grateful Nations event were seven Navy SEALs who were among the 22 SEALs who were killed when their helicopter was shot down by Taliban forces in August of this year. Altogether, 30 Americans were killed in that incident. Most of the SEALs killed were part of SEAL Team 6, which killed Osama bin Laden in May inside Pakistan. However, none of those killed were part of the unit that actually raided the bin Laden compound, according to news reports. I have attended this event for almost all of the last 14 years. It is one of the most moving events I ever attend, as the six heroes are introduced and their stories are told. They are chosen by their respective branches of the military, and are meant to represent the heroism exhibited on a daily basis by all of the men and women who occupy our nation’s military. A Google search indicates that there has been no media coverage of this year’s event. For extraordinary heroism in combat as the senior Medical Sergeant for Special Forces Operational Detachment Alpha-765 in support of Operation Enduring Freedom in Panjwai District, Kandahar Province, Afghanistan. On 24 June 2006, during Operation Kaika, then-Sergeant First Class Brendan O’Connor led a quick reaction force through Taliban positions to reinforce a surrounded patrol. Sergeant O’Connor led the consolidation of three friendly elements, each surrounded, isolated, and receiving fire from all directions. He was instrumental in keeping his team alive during more than 17-hours of sustained combat much of it so close that he and the other defenders could hear Taliban fighters swarming their perimeter. Alerted that two soldiers were wounded at another position, Sergeant O’Connor, crawled alone, under intense enemy machinegun fire to reach the soldiers where he provided medical care while exposed to heavy volumes of unrelenting Taliban fire. He then carried one of the wounded 150 meters across open ground to an area of temporary cover. In bringing the wounded back to the position, he carried them over a wall three times, in plain sight of the enemy, while bullets pounded the structure around him. Sergeant O’Connor’s remarkable actions are in keeping with the highest traditions of military heroism and reflect credit upon himself, the Combined Special Operations Task Force-Afghanistan, Special Operations Command-Central, and the United States Army. For this action, he was awarded the Distinguished Service Cross. Sergeant Joseph M. Perez is commended for personal achievement while serving as Squad Leader, 1st Squad, 3d Platoon, Company F, 2d Battalion, 2d Marine Regiment, Regimental Combat Team-7, Marine Expeditionary Brigade-Afghanistan, on 27 December 2009 in support of Operation Enduring Freedom. During this day, while on patrol in the vicinity of Luguryan Village, Helmand Province, Sergeant Perez received reporting that Taliban fighters had his squad surrounded and were ready to ambush his unit from five mutually-supported machinegun positions. Anticipating enemy fire, Sergeant Perez split his squad into three elements. Seconds later, machinegun fire pinned his base unit down, isolating them from the rest of his squad and injuring his patrolman. Knowing the enemy’s intention to capture the isolated Marine, Sergeant Perez attempted multiple times to reach him, but was denied by heavy enemy fire. He then ordered his 2d Fire Team to attack from the north, a move that effectively reduced the enemy’s fires. Still under heavy enemy fire, Sergeant Perez exposed himself to the enemy, sprinted 50 meters to render aid to his injured Marine. Continuing to expose himself to enemy fire, Sergeant Perez directed the internal fire support of his squad and led his base unit toward the enemy positions. After closing on the enemy positions, Sergeant Perez found two enemy fighters that had been killed and captured one that was wounded along with his machineguns and ammunition. Sergeant Perez’s initiative, perseverance and total dedication to duty reflected great credit upon him and were in keeping with the highest traditions of the Marine Corps and the United States Naval Service. For this action, he was awarded the Silver Star. For meritorious achievement while serving as small boat casualty evacuation officer aboard the destroyer USS Sterett from the 19 February 2011 to 27 February 2011, Lieutenant Junior Grade Haught performed his demanding duties in an exemplary and highly professional manner, directly contributing to Sterett’s dauntless response in the rescue attempt of the sailing yacht Quest, an American flagged vessel which was pirated by Somalis in the northern Arabian Sea. Displaying steadfast determination, and unfailing courage, he directed his small boat to deliver combat medic rescue forces to the Quest after suspect pirates fired upon Sterett with assault rifles and a rocket propelled grenade launcher. After the Quest was secured, it was necessary to bring it to port for criminal analysis. With unwavering dedication to the mission, he personally sailed the Quest 550 miles to Djibouti a journey that took three days and nights amidst adverse sea conditions while maintaining the fully intact crime scene preserving evidentiary integrity for the Federal Bureau of Investigation. Lieutenant Haught’s distinctive accomplishments, unrelenting perseverance and steadfast devotion of duty reflected credit upon himself and were in keeping with the highest traditions of the United States Naval Service. Petty Officer Second Class Timothy Webb has dedicated himself again and again over the past several years to the global fight against terrorism, distinguishing himself through superior performance, outstanding initiative, unimpeachable integrity and patient teamwork. Serving aboard the 110-foot Coast Guard Cutter Wrangell from 2007 to 2008 and forward deployed to the Kingdom of Bahrain, Petty Officer Webb participated in 10 maritime patrols throughout the Arabian Gulf, diligently serving over 4,000 operational hours – more than double the operational tempo of stateside Coast Guard Patrol Boats. An exceptional boarding team member and key component of the ship’s highly skilled special Response Boarding Team, Petty Officer Webb conducted over 80 high risk vessel boardings, successfully deterring possible illegal or terrorist activity in the vicinity of Iraq’s high value oil terminals. In April 2011, he reported aboard 110-foot Coast Guard Cutter Maui to support Operations Enduring Freedom and New Dawn. Eagerly volunteering for one of the most dangerous assignments available to Patrol Forces Southwest Asia personnel, the U.S. Navy’s Fifth Fleet Area of Operations, Petty Officer Webb joined the Coast Guard’s Redeployment Assistance and Inspections Detachment for one month, deploying with the U.S. Army’s 840th Transportation Battalion to three Forward Operating Bases in northern and central Iraq. Petty Officer Webb emulates the Coast Guard values of Honor, Respect and Devotion to Duty. Technical Sergeant Theodor V. Hofknecht distinguished himself by outstanding service as a Combat Controller, 321st Special Tactics Squadron, 352d Special Operations Group, RAF Mildenhall, United Kingdom, Air Force Special Operations Command. While deployed to Afghanistan as the Joint Terminal Attack Controller attached to an Army Special Forces Team, Sergeant Hofknecht’s adept employment of airpower and soldiering skills in two notable troops-in-contact situations were instrumental in neutralizing insurgent attacks. He courageously utilized his M-4 rifle to repel point-blank enemy attacks and discriminately controlled ordnance from rotary wing aircraft at danger close distances to win the battles while preserving local support. During the same engagement, Sergeant Hofknecht maneuvered through withering enemy fire to establish and control a medical evacuation, saving the lives of four coalition personnel. The distinctive accomplishments of Sergeant Hofknecht reflect great credit upon himself and the United States Air Force. Staff Sergeant Graham H. Jacobs is commended for meritorious service as the Element Leader, Team 8113, Marine Special Operations Company Alpha, 1st Marine Special Operations Battalion, U.S. Marine Corps Forces, Special Operations Command in support of Operation Enduring Freedom. During this deployment, he consistently led his element and partner nation force with extraordinary precision. His leadership was the hallmark of his unit’s success while providing superb training for the partnered force. Staff Sergeant Jacobs exhibited superb leadership, outstanding professional competence and strategic vision while ardently mentoring more than one hundred Afghan soldiers, peers and subordinates. He conducted over seventy-five ground convoy movements and led Afghan Special Forces on fifteen combat operations that involved direct contact with the enemy forces in Helmand Province. Staff Sergeant Jacobs repeatedly exposed himself to direct and indirect fire in the execution of his duties while combat advising Afghan forces in a very kinetic environment. His ability to calmly assess a tactical situation and inspire Afghan leaders to excel in the face of adversity is exceptionally noteworthy. Staff Sergeant Jacobs’ leadership, initiative and selfless devotion to duty reflect great credit upon himself and were in keeping with the highest traditions of the Marine Corps and the United States Naval Service. For his actions, he was awarded the Silver Star.